Who says Madrid is Barcelona’s less attractive step sister? Our hotel on the Plaza de Santa Ana teems with the Spanish version of the 1940’s elegance of the U.S.
Full cognizance escapes my jet-lagged brain, but my liberated mind registers all the color from the passing multitude of beautiful women and handsome men like the fanning of a 64-count box of Crayolas. Several bull fighters are staying in our hotel. Where to eat? How far is the Prado Museum? How wonderful it is to hold the arm of my husband while we stride leisurely, a world away from jobs and crazy schedules. Much to absorb. Yet all l I can think about are my hunger pains. 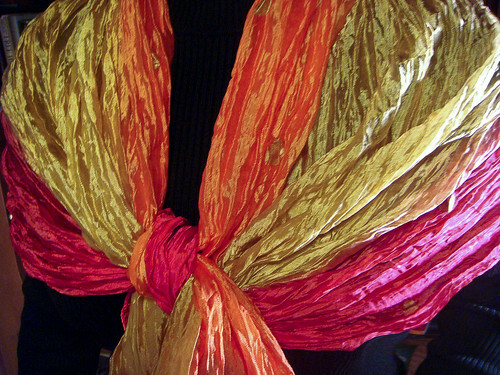 Catching glimpses of the colorful scarf around my shoulders as my head turns back and forth has a magical effect. The soft swish of silk beautifully accompanies the Madrileños charming trill. The last year of freelance writing has negatively affected my dress habits. I packed for this trip with a strict departure from my daily wardrobe of jeans and t-shirts. Still a bit tired from the flight from the U.S. and the hectic schedule prior to departure, we wandered back to the rooftop lounge of the Midnight Rose, the restaurant in our hotel. Black Mojitos, saffron and shrimp croquettes and steamed brioche filled with buffalo mozzarella and truffles, soothed our hunger pains and staged a short-lived but energetic second wind. The hotel in Madrid, ME Madrid. The Fuzzy Slipper Travel Chronicles © is a series I began to give life to a trip to Spain/Morocco that was recently canceled. To interject your own ideas about what I should imagine seeing or doing during this trip, send me an email! If you’d like to join me on this trip of traveling fiction, subscribe to a RSS feed here. Great web site with a lot of useful material! I enjoy it! Thanks for discussing such great info with us, i cherish it. write. The sector hopes for more passionate writers like you who aren’t afraid to say how they believe. Always follow your heart. Definitely, what a fantastic site and informative posts, I surely will bookmark your site. write a litte more about this topic? I’d be extremely thankful whenever you could elaborate a little bit of more. Thanks! Oh, my the scarf is soft. And the menu…I’m so hungry! What’s on the agenda for the next day? What beautiful imagery…not to mention the photos. I can see myself there taking it all in. If it’s a “64 Color box of Crayons”…. what color am I? Great word picture! I want more…..